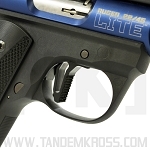 Get a lighter, smoother trigger pull in your Ruger® MKIII™ and Ruger® 22/45™ with the Volquartsen Firearms MKIII™ hammer. 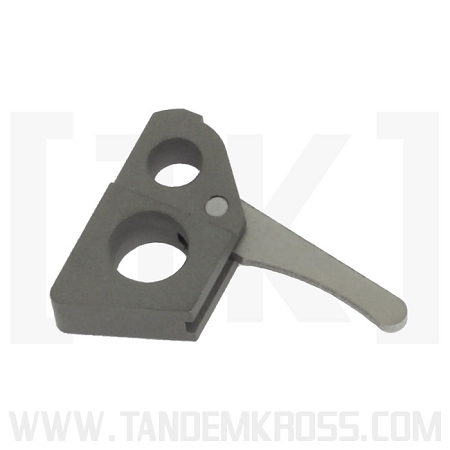 Combine with a TANDEMKROSS "Victory" Trigger for the ultimate 22/45™ trigger upgrade. Whether you’re competing in NSSF Rimfire Challenge, Steel Challenge or other shooting sports, an upgraded hammer is a simple fix that can dramatically improve your shooting times. 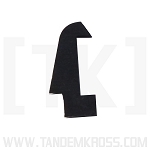 The Volquartsen Target Hammer for Ruger® MKIII™ and Ruger® 22/45™ is a drop-in upgrade that significantly improves the speed and consistency of your trigger. The hardened, precision-ground hammer is designed to work with the Ruger® factory sear or Volquartsen Target Sear, and is electro-polished for a smooth sear surface, crisp trigger pull and reduced lock time. 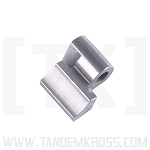 The Volquartsen hammer can also be used with the TANDEMKROSS Steel Hammer Bushing to remove the 22/45™ magazine disconnect, allowing the gun to fire without a magazine seated and allowing magazines to drop free when released. easy drop in if you pay attention and do it right. when combined with the new sear, it dropped the trigger weight to 2-2.5 pounds (my scale is not all that precise. 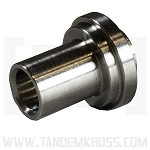 This hammer, combined with the TK magazine disconnect bushing and the Volquartsen target sear, makes for a very formidable package. All I can say is excellent. Well made replacement for the factory hammer. Huge improvement when used with target sear. Worth the money for improved shooting. I installed this in my Mark III 22/45 Lite, and I am absolutely impressed with the difference. I installed the Volquartsen target Hammer, target sear, Tandemkross Victory Trigger, and hammer bushing all at the same time. The installation was easy. I just followed the video, and was done in no time at all. It's made an impressive difference in trigger pull. Nice and crisp now compared to the factory original. Purchased the hammer and sear together. I installed both in my newly acquired MKIII. They were both drop in ready and the job only took minutes to complete. What a differance it made. If I knew before the differance, I wouldn’t have procrastinated so long.